Paddle fringe chain can be used alone in earrings or necklace designs. Looks even better with beads of any kind mixed in with the paddles. 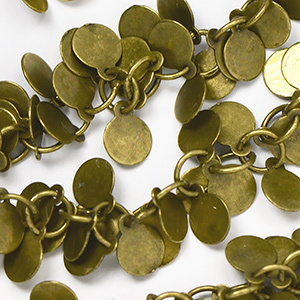 Each link has two paddles and this chain is plated with a brass ox method of antiquing. Priced and sold by the foot the more you buy the more you save! We ship the longest sections possible with few connections. However, we cannot guarantee one continuous piece for longer sections.